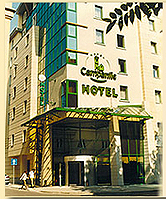 The new two-star Campanile Hotel is located in the city center of Krakow. Its favorable location guarantees easy access to almost every interesting place of the former capital of Poland. There are 106 spacious and comfortably furnished rooms, each of them equipped with a radio, TV Sat, and telephone providingÂ internet access. Amenities of the hotel include a cocktail bar and 4 conference rooms. The hotel organizes excursions to and outside the city. Other facilities include lifts and limited parking places. We accept the following credit cards : VISA, Mastercard, Eurocard, Maestro, American Express. The hotel is located 50 m away from the main railway and bus stations. The airport is 20 km from the hotel, and you can easily reach the hotel from it by bus (nr 208) or taxi.